Want better coffee? 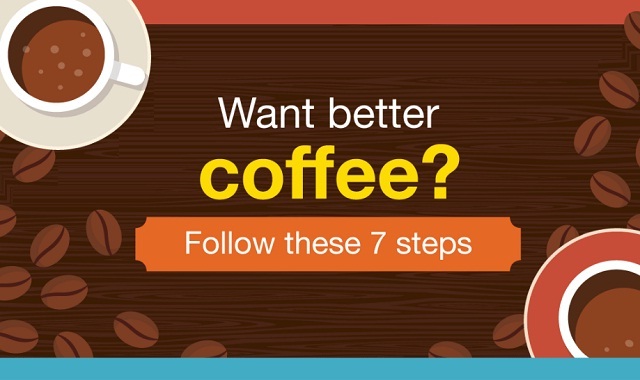 Follow these 7 steps #infographic ~ Visualistan '+g+"
Let’s face it, sometimes it feels like making coffee at home is not only inconvenient, but less delicious. Without the right combination of coffee beans, purified water, and a clean machine, you may be left with a burnt-tasting, acidic cup of lackluster coffee. Thankfully, there are a few key steps you can follow for a fresher, more flavorful cup of coffee. For starters, it’s a good idea to find a local coffee roaster for the freshest beans possible and opt for whole bean rather than pre-ground. Then it’s all about storing your coffee the right way—in an airtight glass or ceramic container. Investing in the proper equipment and accessories, such as a burr coffee grinder and a scale, can help you brew a more precise and consistent pot of coffee. Ready to learn more? Read on for the rest of our tips.